A huge peach aroma wafts out as soon the cork is popped on the 750-milliliter bottle. The beer is a beautiful peach color when you pour it into the glass. And a lovely peach flavor dominates this Belgian lambic. I have to admit it took me a long time to come to terms with drinking a peach beer. Previously I had enjoyed Lindemans Framboise (raspberry) and Kriek (cherry) Iambics, but the idea of peach-flavored beer put me off. And, there you have the essence of this beer. It is a sensual experience meant to be shared. “It’s probably the most gratifying of any of the beers in our portfolio,” said Craig Hartinger, marketing manager with Seattle-based Merchant du Vin, importer of Lindemans beers. “We get a lot of wonderful feedback,” he said. “It’s a lot of fun to pour those beers at tastings, see eyes light up when they taste it.” Retired Merchant du Vin founder Charles Finkel is responsible for suggesting the brewery make a peach lambic in the late 1980s. “He’s a foodie, and I think he was just thinking about what delicious fruit flavor was not currently being used in lambics,” Hartinger says. 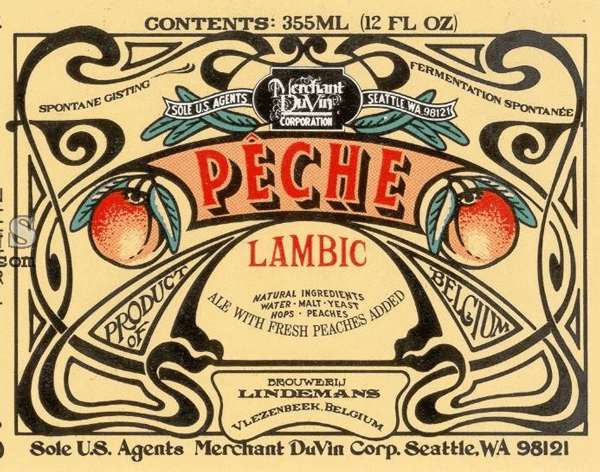 Peche Lambic, which made its debut in 1987, is the second-best Lindemans seller in the United States, Hartinger says. Framboise is No. 1. Some lucky beer lovers can find the Peche and Framboise on tap, the only two beers from that brewery available on draft in this country. The Lindemans website (lindemans.be) offers an excellent explanation of lambic beers. Lambics are wild-fermented beers from the cherry-growing region of the Senne River valley in southern Belgium. In addition to barley, lambics contain at least 30 percent wheat. The beer is aged for two years in oak casks, and then mixed with fresh fruit before bottling. In the case of Peche Lambic, Hartinger said pure peach juice is added to the beer. Positively peachy, I say.